This post originally appeared in the August 2006 issue of the Harry Ransom Center’s monthly eNews. 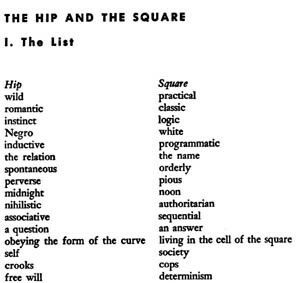 How would you update Norman Mailer’s “The Hip and the Square” list for 2015? Tell us in the comments below. In the fall 2006 exhibition Norman Mailer Takes on America, visitors were asked to record their thoughts on three different topics that Norman Mailer had responded to over the course of his writing career. Composition notebooks and pencils were provided for visitor response, and the notebooks have become part of the Ransom Center’s archive. In the year that followed, Mailer wrote frequently about the opposing terms “hip” and “square,” both of which are still in use today. Here are some of the responses that visitors came up with to define the terms.